Norwegian is proud to announce that Antarctic explorer Sir Ernest Shackleton is the airlines latest tail fin hero. The renowned explorer’s portrait graces the tail fin of a Norwegian Boeing 787 Dreamliner aircraft which has taken to the skies this month. To reflect Norwegian’s rapid growth in the UK, where it now flies 5.8 million UK passengers each year to more than 50 destinations, the airline has launched a series of UK tail fin heroes. 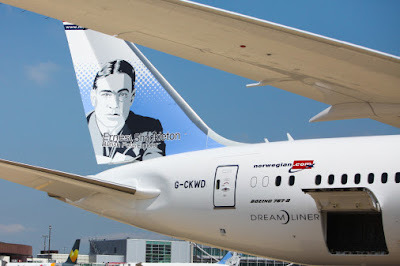 Sir Ernest Shackleton has become Norwegian’s seventh UK tail fin hero, following the announcement of poet Robert Burns, rock legend Freddie Mercury, author Jane Austen, footballer Bobby Moore, children’s author Roald Dahl, pioneering pilot Amy Johnson and aviation maverick Sir Freddie Laker.